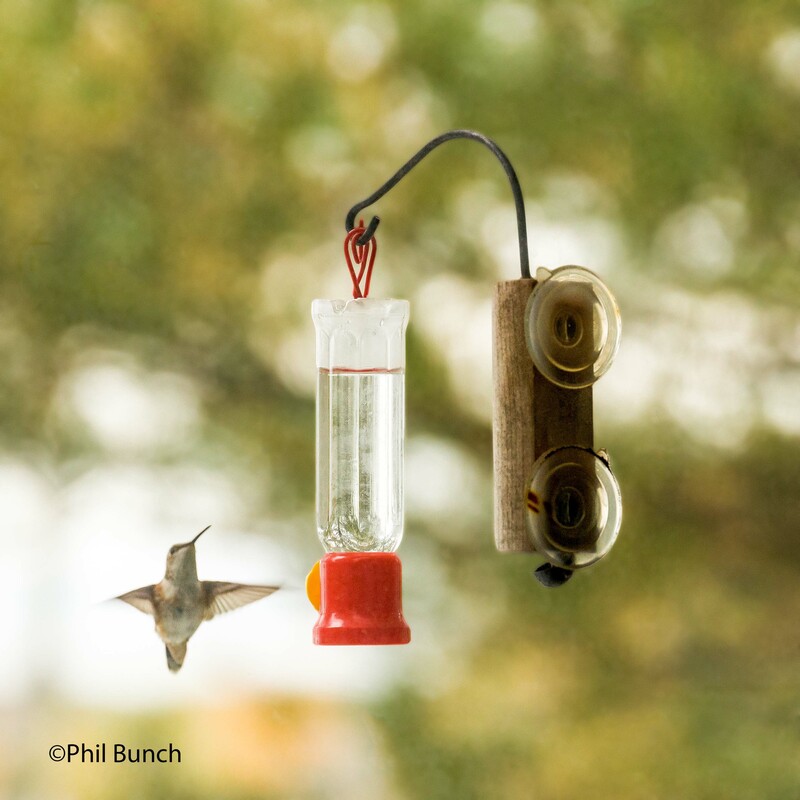 Most of Maine’s Ruby-throated Hummingbirds have departed by the middle of September, but there are always a few migrants and lingering juveniles into the first few days of October. But as October progresses, Ruby-throats become few and far between, and with each passing day, any hummingbird becomes more and more likely to be something other than our familiar Ruby-throat. In recent years, Western vagrants including Rufous and Calliope have appeared in Maine, while neighboring states have seen several others including Black-chinned and Allen’s. It’s just a matter of time before Maine adds another hummer to its state list. In fact, my Next 25 Birds for Maine predictions list includes Black-chinned (#9), Anna’s (#13), and Allen’s (#16). 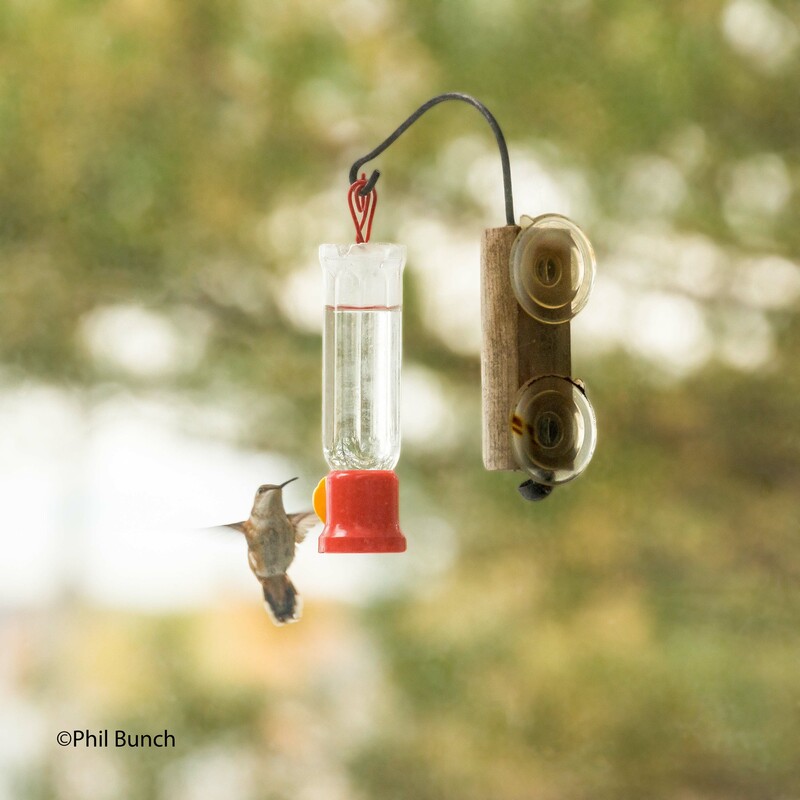 Key to the observation of late season hummingbirds is continuing to dispel the silly (but persistent) myth that you have to take down your hummingbird feeders (on some arbitrary day like Labor Day) or the birds won’t migrant. But as usual, the birds are smarter than we are, and proceed as directed by hormonal changes triggered by the decreasing daylength. A nice patch of nursed flowers or any number of hummingbird feeders won’t stop them, but it’s the last truant birds and wayward vagrants that can really use the helping hand. Here at the store, we have been working hard to dispel this myth for years, and get people to not only keep their feeders clean and nectar fresh (and always free of dye and color!) for as long as feasible, preferably into early November. We also urge people to contact us with any hummer sightings after October 1st, and take a picture if possible. And happily, folks have. Some have gone unconfirmed as a brief sighting came and went or we learned of the observation belatedly, and others have been nicely documented. Last fall, I chased one in Falmouth on October 14th that turned out to be a Ruby-throat, much to my surprise (and somewhat, to my chagrin). The word is getting out, at least. Last Friday (10/17) we got a call from Lois Randall and Phil Bunch on Cousin’s Island in Yarmouth. 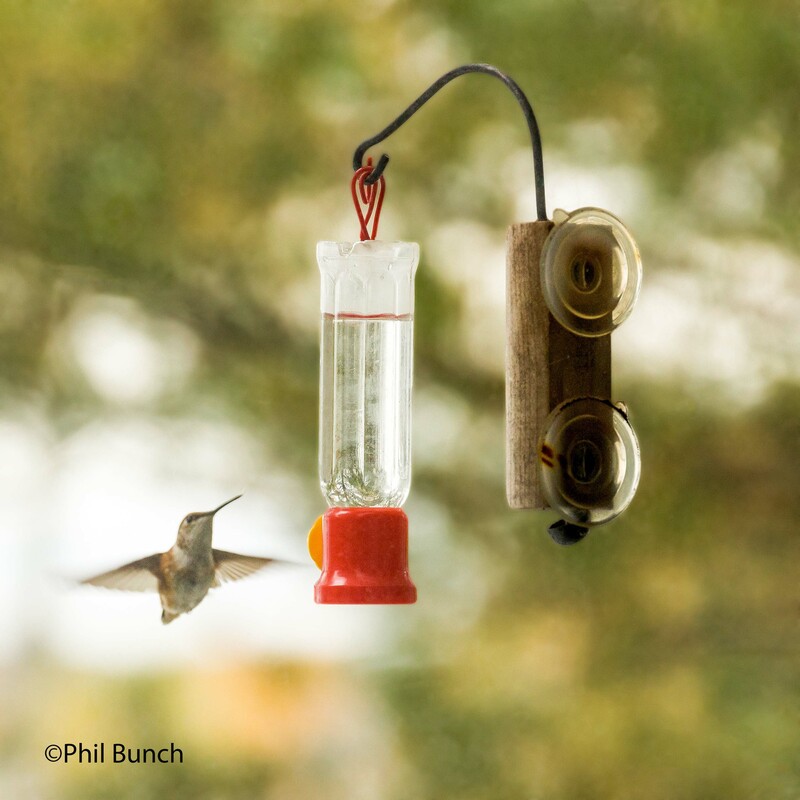 A hummingbird had been present all day, and it was photographed. I learned of the bird too late in the day to chase it, but I had hoped to go on Saturday. Lois told us it was still present in the morning, so I found some time in the early afternoon to make a quick run over. Unfortunately, I arrived to find out the bird was last seen at around 8:00am, but I was able to view Phil’s photos. And sure enough, this one was NOT a Ruby-throat. I received all of the photos today (10/22) and was able to take a long, hard look at them with references handy. 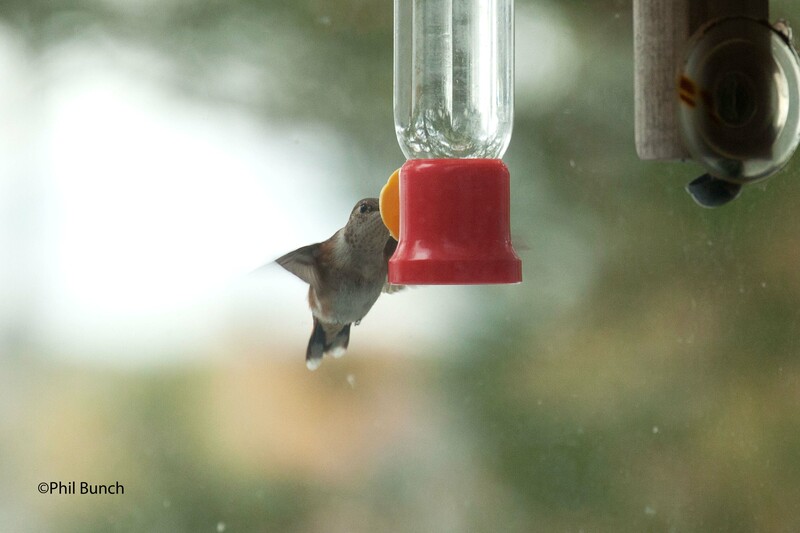 It’s clearly a hummingbird of the genus Selasphorus, with its extensive buffy sides, buffy undertail, and – although it’s really hard to see – just a hint of the rufous in the base of the tail feather (see Photo 1). There’s not much here to work with, but the overall pale plumage and limited rufous-orange further suggests that this bird is an immature female, although some young males can be equally as pale. And immature Selasphorus hummingbirds are tough, especially the females! In fact, most are unidentifiable beyond Rufous/Allen’s, with only (most) adult males readily identifiable in the field. 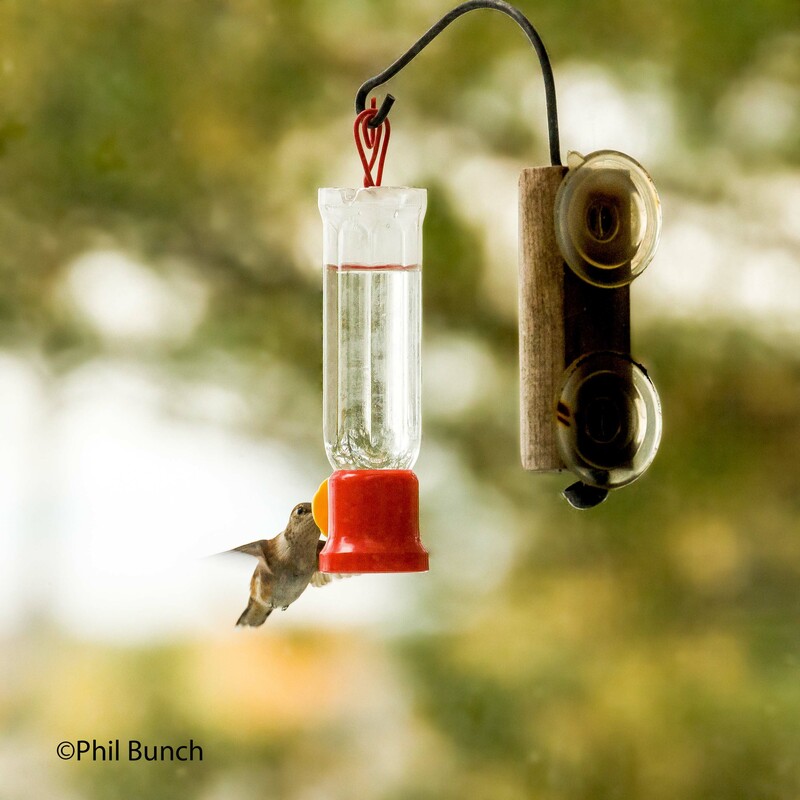 In-hand measurements are usually required, or the holy grail of hummingbird photos – the upperside of the spread-tail. And of course, seeing the upperside of the tail (especially when spread), uppertail coverts, and rump would go a long way in identifying this bird, but we will work with what we have – and I am thankful for these photos (most hummingbird reports we receive are not photographed at all)! The bill and tail both look too long to me for Calliope, and there’s probably a little too much white in the tail. I also think we can rule out Broad-tailed by the fairly extensive buff sides, but perhaps that could still be considered an outside possibility. But despite Phil’s fine photos, I don’t think we can move beyond Rufous/Allen’s here, although the relatively broad and rounded outermost tail feathers (visible especially on Photo 1) are more suggestive of the more-expect rarity: Rufous Hummingbird. I think Photo 2 is also suggestive of the width of those outer tail feathers, but it also shows an awful lot of white, making me think we’re also seeing an artifact of light passing through the tail tips in this photo. Other photos show the buffy undertail typical of the family, better views of the sides and flanks, and the overall color and pattern of the head and throat. 1. First sighted on Friday October 16 at 8AM feeding amongst the flowering Agastache plants (common name: Hyssop) on our deck. As the bird darted rapidly back and forth, I caught a glimpse of its back and saw patches of iridescent green. 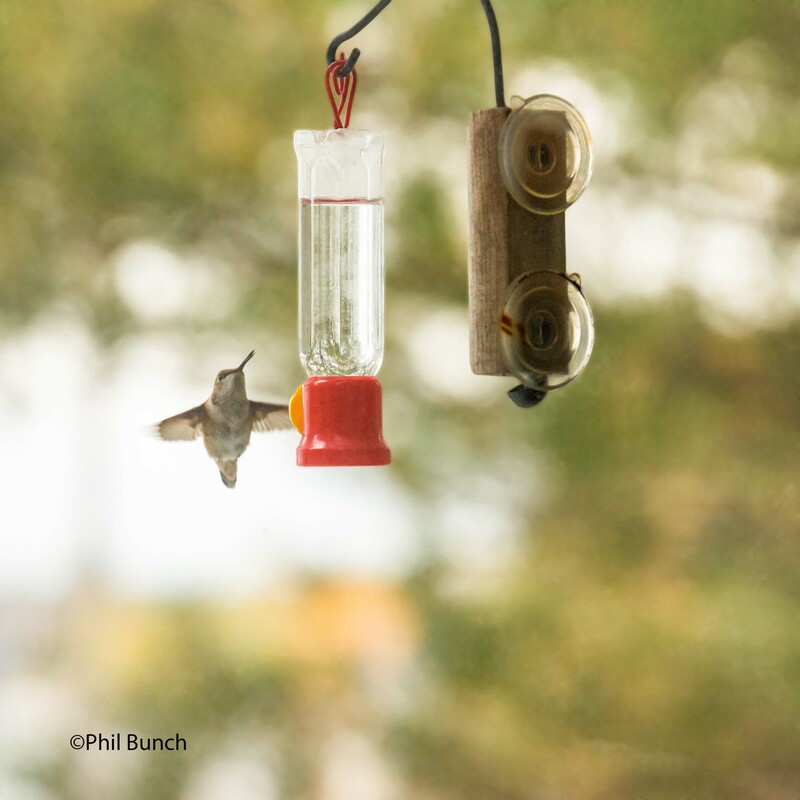 The bird soon discovered the tube feeders hanging on our sliding glass doors and proceeded to feed on the hummingbird nectar vigorously throughout the day. 2. In addition to the single glimpse I got of the green “highlights” on areas of the hummer’s back (thanks to a flash of sunlight on an otherwise cloudy day), I noticed the white tips on the hummer’s tail, and noted rusty highlights on the bird’s “armpits”, otherwise whitish shoulders, and on the bird’s sides (flanks?) I also noted that the bird had a rounded full-looking belly. 3. 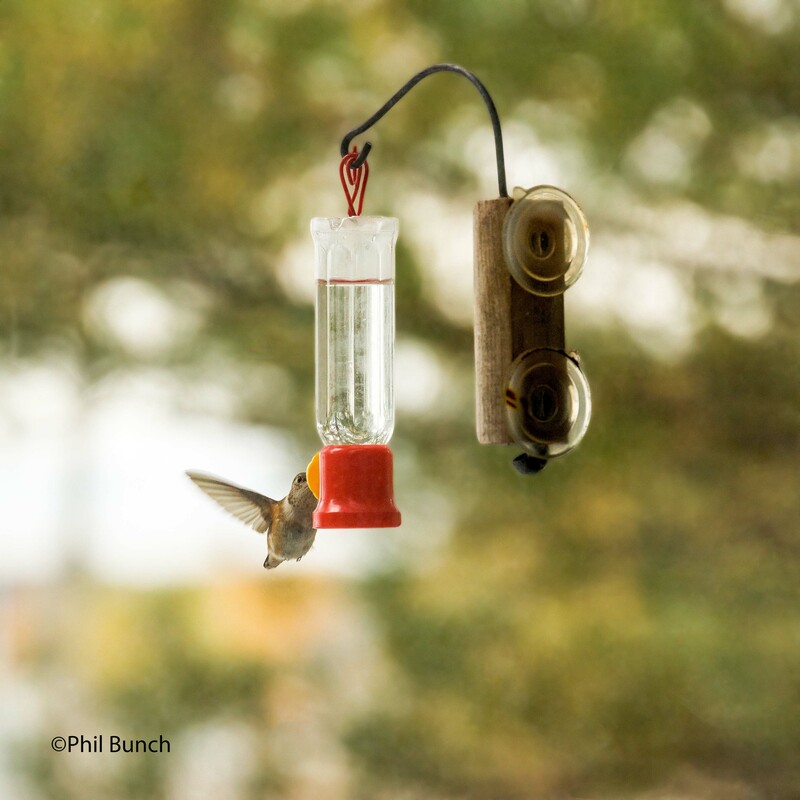 I last saw the hummingbird briefly at 8AM, Saturday October 17, 2015. It visited the hyssop flowers briefly, flew off, and we haven’t seen it since. We will continue to watch for it in case it returns sometime this afternoon or tomorrow morning. Our best hope is that it “refueled” here and safely continued on its journey south. 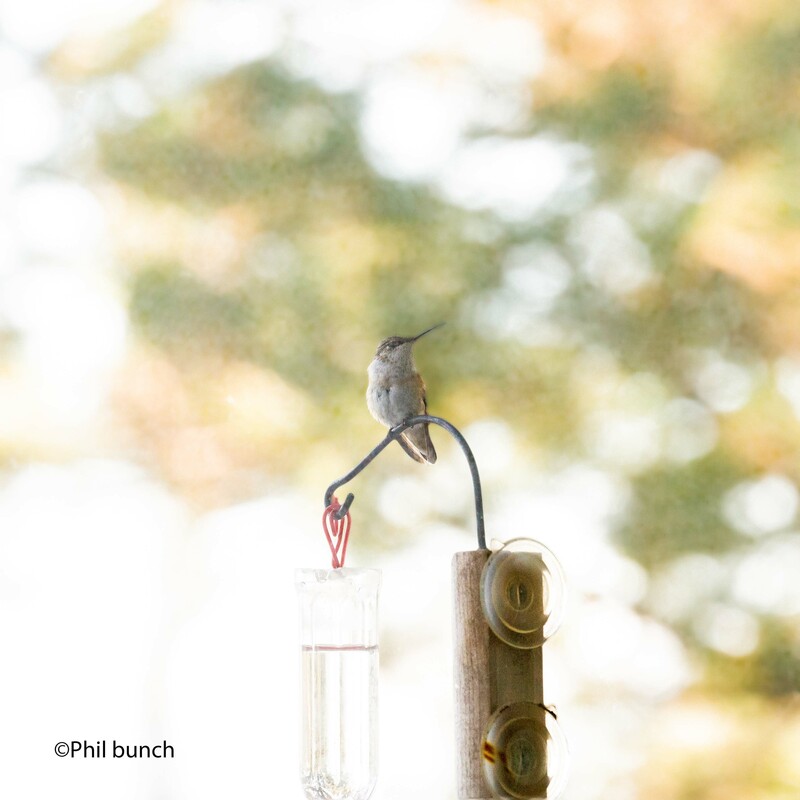 So while this bird will remain unidentified to species, Lois’s notes and Phil’s photos combine to nicely document an immature Rufous/Allen’s Hummingbird – one of just a handful of confirmed records for Maine. I suspect vagrant hummers are more regular in Maine then currently reported, so keep those feeders up, nurse those plants, and keep the reports coming in! This entry was posted in Birding in Maine, Rarities and Vagrants and tagged "Birds, Birding, rarities, Rufous Hummingbird, Selasphorus hummingbird, vagrant on October 22, 2015 by Derek.